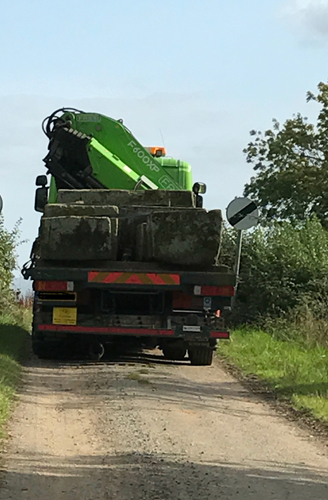 - They are beginning to arrive! There is no doubt that some of the best stone troughs in the world come from this country. 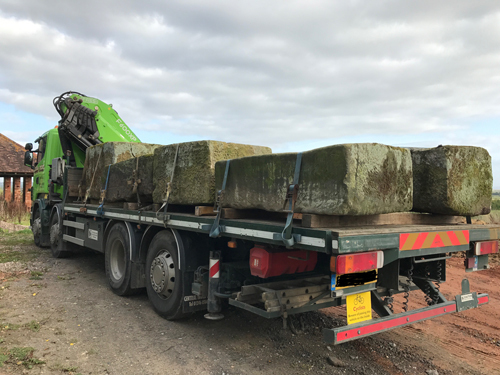 Beautiful hand hewn pieces of local stone for use in the past as water or feed troughs on the farm or for plants nearer to the main house. We are still able to find some really good examples to offer to our customers periodically. It is extremely rare, however, to have the opportunity to purchase an entire lifetime collection in one place. 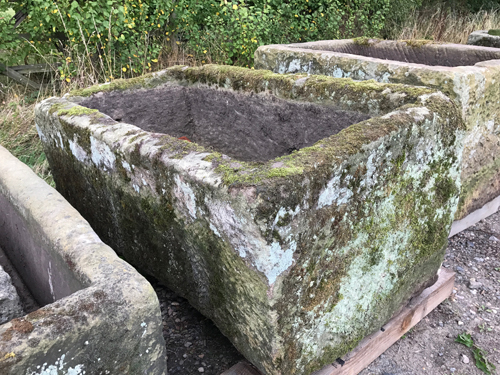 This group of Yorkshire stone troughs, exclusively on offer to customers of J’s Garden Antiques, has been put together over a lifetime of collecting. There are troughs from the largest one I have ever seen through to the smallest. There are over 50 troughs in all, with around half of those being really good sized ones. There are also sinks on legs, long troughs on bases, large water troughs, lovely double troughs and small deep ones which is a really rare thing too. Also it includes some lovely small sinks which, on legs, make wonderful bird baths. There is something for everyone in this collection and before they go on our website I would like to offer our customers an exclusive preview of them. If you would like to come and visit us to view the collection it will be here by the middle of next week. Please let me know if you want to come and have first choice. If you are unable to do that and would like to make your choice anyway, I will send a full list of them with pictures to anyone who gets in touch with me. As always they will be honestly described and photographed to give you a proper view of them. Full details of size and price will also be included of course. - There are many more to come - these are just the beginning. If you have never been I would highly recommend a visit to this garden. I was completely thrilled many years ago by seeing an exhibition of Monet’s paintings in the Royal Academy. I had always loved his work but there is simply nothing like seeing masterpieces for yourself. To be within touching distance, to see the brush strokes and the layers of colour was amazing. Also there is a presence and a feeling about them that you just cannot get from a book. The excitement I felt that day will stay with me always. So the experience of the master at work in a garden was simply too good to miss. To see his studios there and the light and colour in his house and garden was the most wonderful experience. 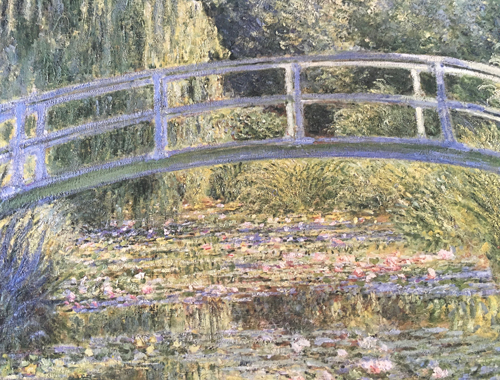 “Impressionism brought painting out of the Dark Ages and infused it with sunlight and fresh air, introducing it to the great outdoors and pouring light onto the canvases where none had shone before.” A quote from Monet’s Garden. Through the Seasons at Giverny by Vivian Russell. 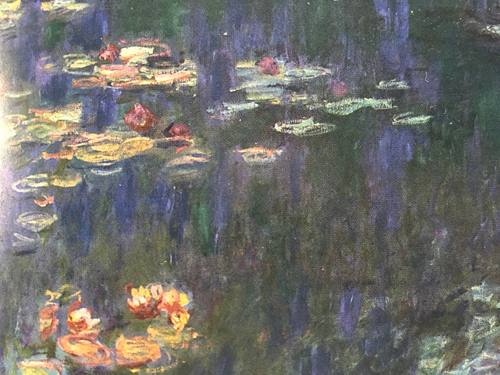 Monet had a love of light and colour. He experimented with reflection on water, as a mirror to the world. The famous water garden at Giverny is a particularly special part of the garden. 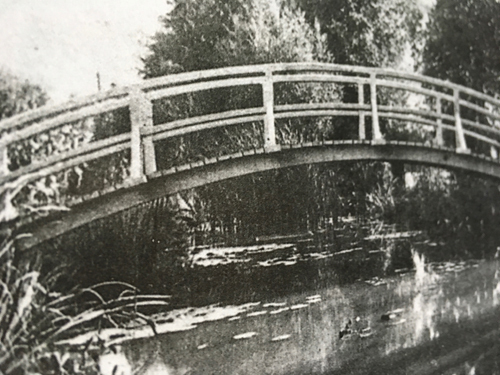 It has an oriental feel with the green painted bridge and the willows and water lilies. “I love water” he said “..but I also love flowers”. Simple as that! It is however, one of the most inspirational places I have ever had the pleasure to visit. I love my garden and I love the excitement of mixing different colours and textures of plants – it is the joy of gardening. With flower arranging it is the closest I get to painting and I feel that Monet created his garden as a painting - an ever changing, living being.
. Chelsea Flower Show - May . The presence of water in any environment has always drawn people to gather. A spring was often at the centre of settlements for obvious reasons across the ages. Village centres still have water fountains or natural springs running into troughs from the land around. We are all attracted to rivers and lakes, any body of water. The sight and sound is simply comforting and pleasing. Just to sit beside a river and watch it flow by is one of the most relaxing things to do. This can also be achieved by water in a garden setting. I notice that at any of the flower shows that we do, if we have a bubbling water feature running somewhere amongst our display, people will stop and be drawn to it. We often hide water in amongst the plants in a trough with just a small trug or something and a little pump recycling the water, causing a bubbling sound. It is a real pleasure to find peace in amongst the bustle and crowd of people at the show. The sight and sound of water in amongst the plants in the garden is possible for all sizes of gardens and if you do not have the space for a lake, pond or pool, using troughs for water is a great idea. Talk to us about what might work for you. We have no further shows this year but are always pleased to see you if you would like to visit us at our base. Viewing by appointment only please.